WAVELLITE is perhaps the second best known collectable mineral in Arkansas, quartz being the first. Two specimen localities are well documented. The earliest collected site is near the community of Avant on the northeast end of Lake Ouachita in Garland County. It is called Dug Hill, because so many past collectors have pot-holed the hillside. The site is on Ouachita National Forest land and the major holes were back-filled and replanted a few years ago. Hands on collecting is generally allowable if you collect for yourself, not to trade or sell. This site produced some remarkable dark green spherical wavellite aggregates on tan to gray sandy chert matrix. When broken across the spheres, wavellite exhibits a radial crystalline structure - the local old timers call it "cats-eye". Color may vary from light to dark green at this locale, the intensity of the color is due to how much vanadium is present in the structure of the mineral. Bright green coatings of variscite, another aluminum phosphate, also occur, frequently with wavellite, here. The second locality is the now abandoned Montgomery County quarry, northwest of Mount Ida some 2.5 miles. This location is also known as Mauldin Mountain. When operational in the 1980s and early 1990s, spectacular apple-green to yellow-green wavellite specimens, ranging up to cabinet size, were recovered by local collectors. Another phosphate mineral, planerite is also present as very small, fish-roe-like, pale green to yellow-green coatings and films on both the chert host rock and wavellite from this site. Some colorless to yellow micromount wavellite crystals were also collected. Since the active quarry operation ceased, little material has been recovered, although hand collecting will usually yield some specimen material. This site is on Ouachita National Forest land also. Collecting for personal specimens is generally tolerated. However, if you ask permission to collect, you are likely to be turned down. We can't give you permission, but if you collect here, recognize that you might be asked to leave and dump out your hard-earned samples before you go. Several interesting colors of wavellite have been discovered in Arkansas. Most collectors are familar with the various shades of green, ranging from dark rich emerald green to bright green, apple green, and pale green. Yellow wavellite has been collected from two localities, one near the Hot Springs city waterworks and the other north of Crows in Saline County. The waterworks specimens were pale yellow radiating spheres in a highly fractured milky quartz vein, obviously secondary after the formation of the quartz veins. The Saline County location yielded T/N to miniature-sized specimens of pale to bright yellow wavellite, both as botryoidal (grape-like) masses and some vein material. The host rock was highly rotten and weathered away at this location so no really large specimens were recovered. Some of the Saline County yellow wavellite is very fluorescent, a nice apple-green color, as a very thin coating of the last mineral deposited. A location in Polk County yielded crystal coatings of yellow microcrystals in a milky quartz matrix. White wavellite, due to the absence of vanadium, is known from several locations including: the Montgomery County quarry, where it is often gradationally intergrown with various shades of green wavellite; the Wilson Springs vanadium mine where it formed as small colorless to white crystalline spheres on limonitic matrix; from one of the novaculite quarries at Hot Springs as thin colorless to white radiating films on black novaculite; and at the Christy vanadium mine east of Magnet Cove in Hot Spring County where I recovered a couple of specimens on dark gray novaculite matrix. A recent find of wavellite from the Montgomery County quarry also turned up some blue-green (almost turquoise colored) wavellite. By far the rarest color is black. Until recently, I was under the impression that black wavellite was simply colored by inclusions of dark clay, but I discovered on a bargain table at one of the local rockshops at Hot Springs several pieces that had distinctive black botryoidal crusts and a nice crystalline luster. The color is solid and uniform across a 2 mm layer in one pocket and several other pieces have half a sphere bright green and the other half black. This material also recently came from the Montgomery County quarry. False locality information concerning wavellite is now on the Internet: Years ago much wavellite from the Avant locality was sold by Joe Kimzey of Magnet Cove. The various dealers and collectors who purchased these specimens often labeled the mineral as being from Magnet Cove, not Avant in Garland County. Today, even on ebay.com, if you search under Magnet Cove, you may find someone selling wavellite with this incorrect location. This locality information was all corrected years ago in a short article by W. G. Shockley in the March 1948 issue of Rocks and Minerals Magazine entitled Wavellite Locality Corrected. He correctly notes that the specimens are from Dug Hill near Avant, Arkansas. I had to send a copy of this article to the Smithsonian Institute a few years ago to get them to correct one of their labels in a display case! So, buyer beware when you see this mineral labeled from Magnet Cove! If you like the specimen, be certain you correct the label after it comes into your possession. Pocket of black wavellite, Montgomery County quarry. Vug-filling green wavellite, Montgomery County quarry. Green and small white wavellite, Montgomery County quarry. Note radiating pattern, termed cat's eye by old-time collectors, of broken spheres. 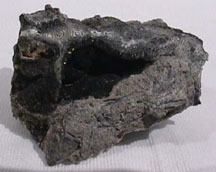 Smith, A. E., Jr., 1985, The Aluminum Phosphate Minerals from Mauldin Mountain, Montgomery County, Arkansas: Min. Record, v. 16, p. 291-295. Howard, J. M., 1987, Mineral Species of Arkansas, a Digest: Arkansas Geological Commission Bulletin 23, 187 p.
Kidwell, A. L., 1981, Phosphate Minerals of Arkansas: Rocks & Minerals, v. 56, p. 189-195. Arkansas Geological Commission MP-19, Rock and mineral collecting sites in Arkansas, contains maps to both localities. Note to Collectors: Please be aware that knowing about these minerals and where they can be found does not grant the right to trespass on private property or mining claims. Even if you consider taking some samples as "just collecting", property owners might consider your actions trespassing and theft. The status of mineral collecting on national forest and Corps of Engineers land is changing, and access is very restricted. Please check with the appropriate landowner, lease or claim holder, or district supervisor before attempting to enter a collecting locality.